Quitting is never an honest option, given your work is incomplete. But what could be better than to quit if the upcoming opportunities promise to serve you righteously? Take initiative and get better treatment with a simple Notice to Vacate those who are not being worthy enough. The notice to quit templates is for evacuating those who don’t pay rents timely commanding them pay the debt. The templates ensure that the tenant will not be renewed.Get these free templates appropriate for commercial purpose and eliminate the ones with a simple download and print option. The templates are available in excel, word, PDF documents. Get hundreds of samples online of these templates and become an example for others. 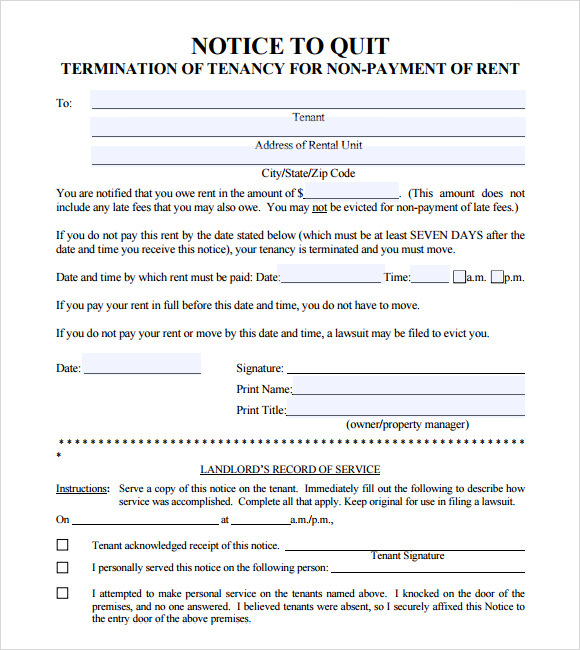 This is a notice that a tenant can give to a landlord to terminate his tenancy. 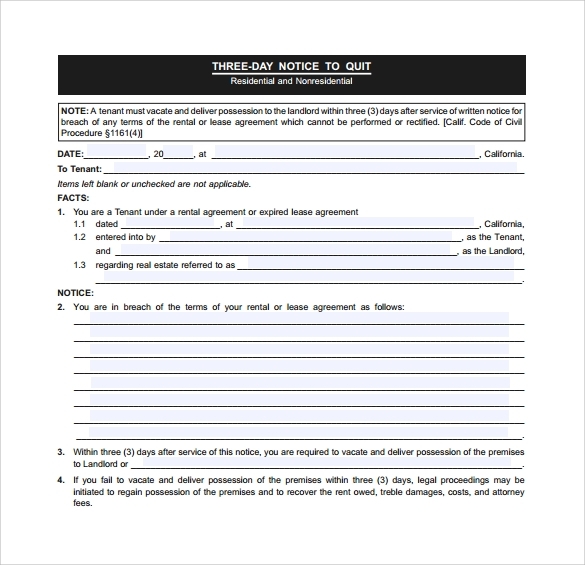 It contains details about both the parties, the property lent, the type of tenancy, and a notice to terminate the contract. There is also a provision to adjust the security deposit, if any. 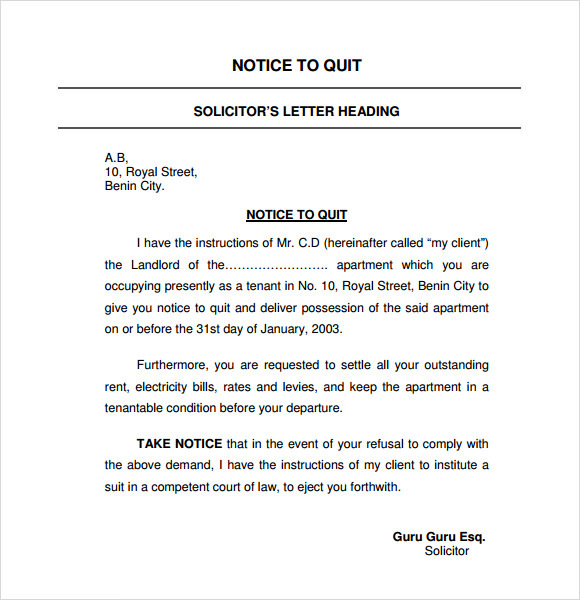 This is a notice to quit template letter that a solicitor can send to a tenant on behalf of the landlord. In this letter, the solicitor orders the tenant to vacate the house as asked by the landlord. If the tenant does not abide by, the solicitor shows his right to eject the tenant on behalf of the landlord. This is a template used to create a 14 days notice. 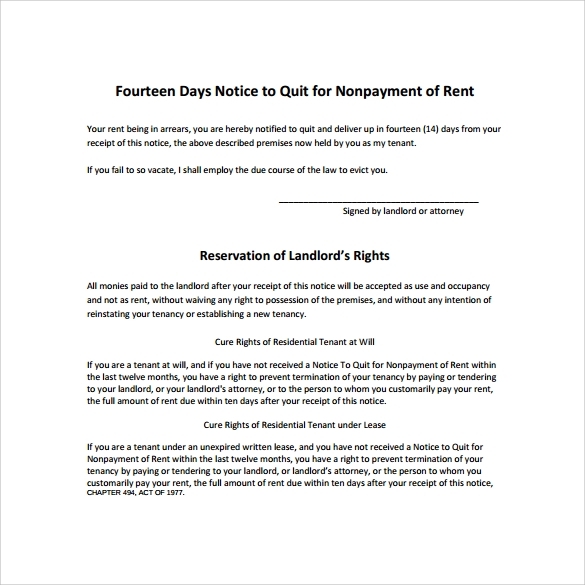 This notice is given to the tenant by the landlord, because the landlord wants the tenant to vacate the property as he has not paid his rents on time. There are certain rights that the landlord possesses if the tenant does not pay his rent for a certain period of time. It is a 14 days notice after which the tenant will have to vacate the property, if he fails to pay the rent during this period too. 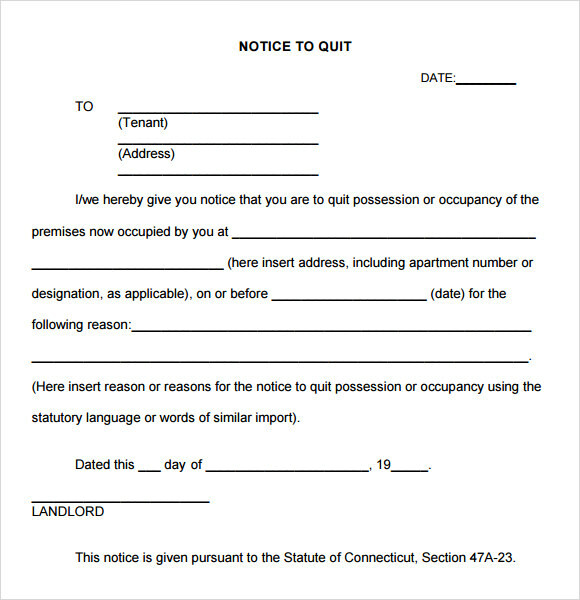 This notice to quit is given directly by the landlord to the tenant, as an order to vacate the property by a specified date. Containing all the details about the landlord, the tenant and the property, this is treated as a legal document to vacate a property and surrender possession. Why Do You Need a Sample Notice to Quit Template? There are certain circumstances under which the landlord may want his property evacuated before the end of the lease. Getting back the possession of the property becomes a landlord’s legal right, in case the tenant is not paying his rent on time. 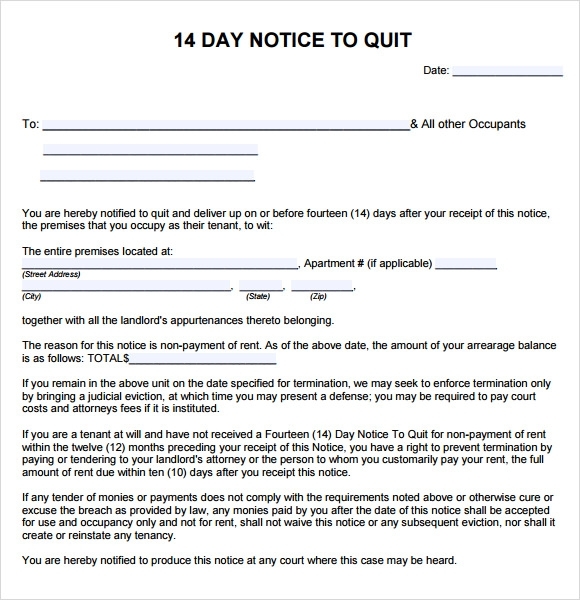 So, in order to give a warning or a notice period to the tenant, a landlord may send this notice to quit to his tenant. When Do You Need a Sample Notice to Quit Template? You need to use a sample notice to quit template if you want your property’s possession back from your tenant. Your tenant might not be paying his rent on time, or you might be willing to use your property for your own personal use. 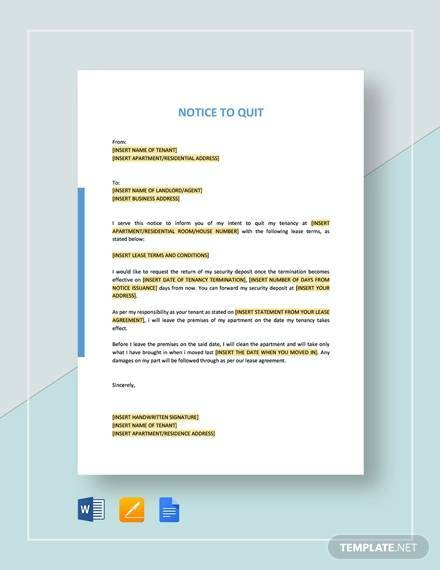 A sample notice to quit template will give you clear guidelines on what language you should use in the notice, and how to get your task done with ease. You may like Final Notice Templates. Evacuating some tenants might not be that simple, and you may need to deal with them in the court. So, these templates serve as legal documents to get your job done faster and easier. 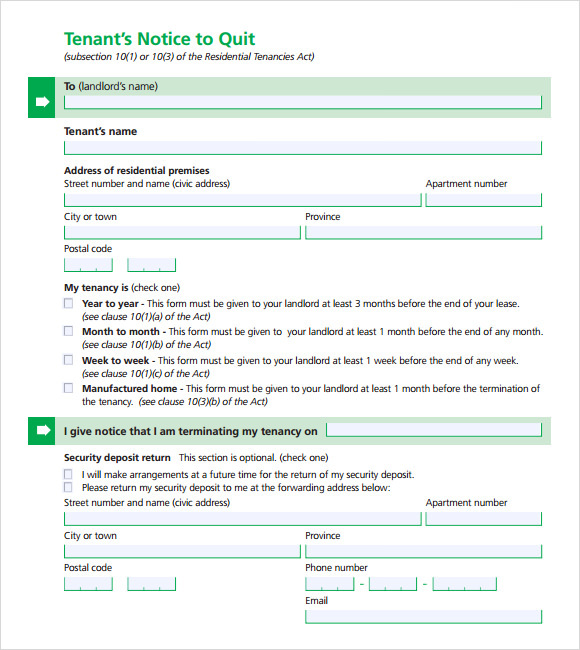 If you are a landlord and caught in a similar situation, then you can use a sample notice to quit template to get your property vacated with ease. 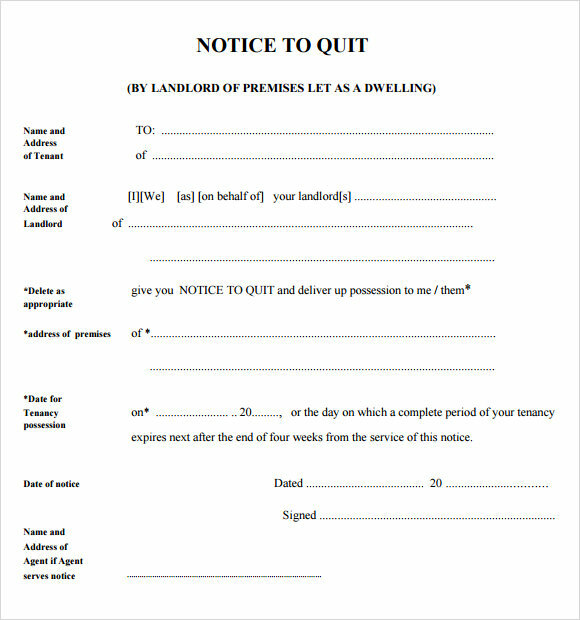 A sample notice to quit template is a perfect document that a landlord can use to get his property back. 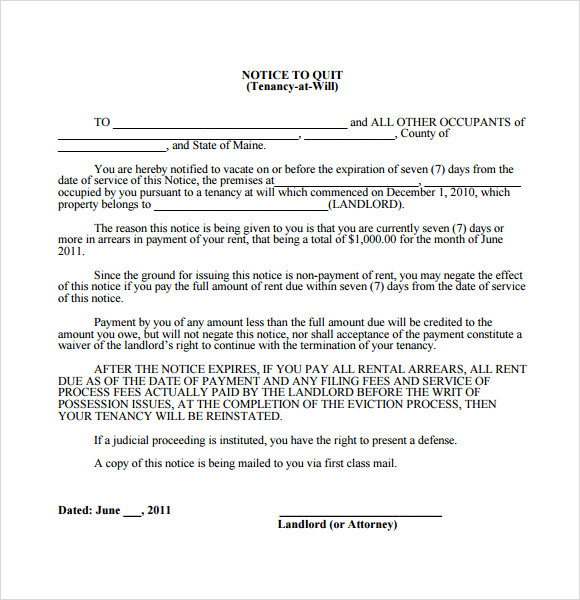 It serves as a legal document to get a property’s possession back from the tenant.